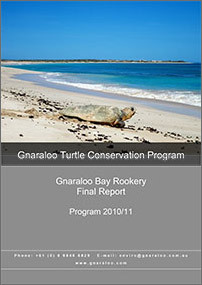 The Gnaraloo Turtle Conservation Program (GTCP) is a scientific research and public outreach program aimed at identifying, monitoring and protecting sea turtle rookeries located along a 65 km stretch of beach at the southern end of the Ningaloo Reef at Gnaraloo, Western Australia. 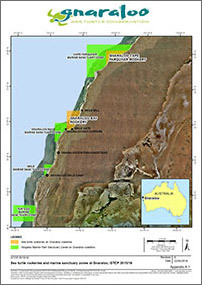 The sea turtle nesting habitat at Gnaraloo Bay, including a 20 km radius internesting habitat buffer, was identified as a habitat which is critical to the survival of loggerhead turtles of the southeast Indian Ocean regional management unit (RMU; Recovery Plan for Marine Turtles in Australia, 2017 – 2027). 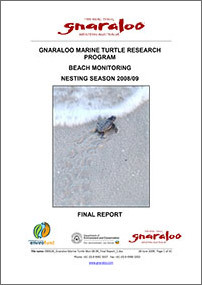 Since 2008, the GTCP has conducted daily beach track surveys, along with a variety of complementary research and monitoring activities (e.g. 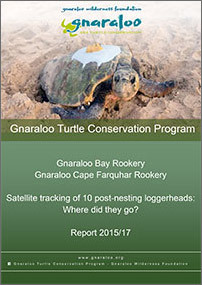 Night Surveys, flipper tagging, satellite tagging, Nest excavations), in the Gnaraloo Bay Rookery (GBR) between 1 November and 28 February. 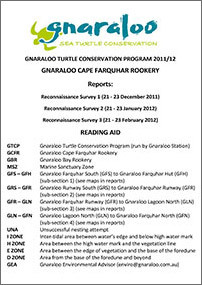 Additional beach track surveys commenced in season 2011/12 in the Gnaraloo Cape Farquhar Rookery (GCFR), which is located approximately 22 km north of the Gnaraloo Homestead and unreported prior to 2011. 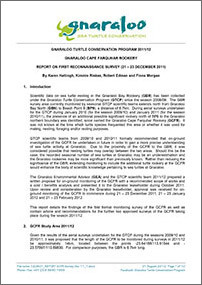 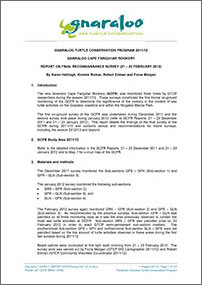 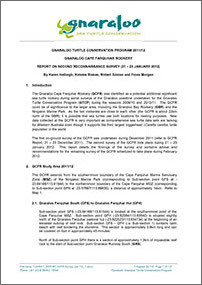 In this document, we report on the activities of the GTCP during the sea turtle nesting season 2017/18 and summarise findings of the 10-year monitoring program. 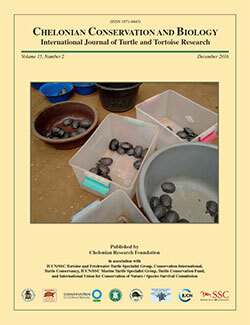 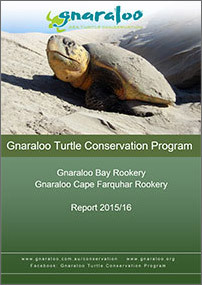 The Chelonian Conservation and Biology – the international scientific peer-reviewed Journal of Turtle and Tortoise Research – published the Gnaraloo turtle research findings from 2008/09 – 2015/16, which total 8 years of successful research at the Gnaraloo Bay Rookery. 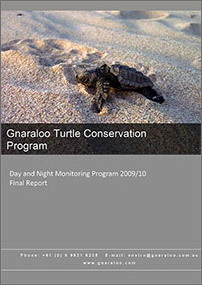 This achievement is in no small part due to our scientific field teams, Gnaraloo staff, the Richardson family, Landcare, the Australian Government, esri Australia and Brains, as well as mentors, advisors, contractors, and other loyal supporters who have assisted the program. 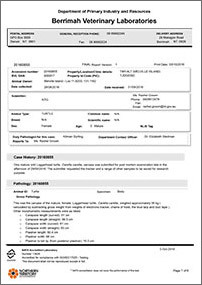 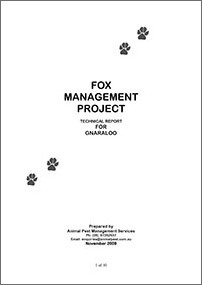 We’re excited to share our detailed scientific reports. 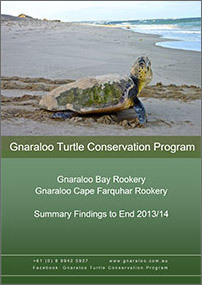 These rigorously researched documents reflect important baseline data on the sea turtles of Gnaraloo. 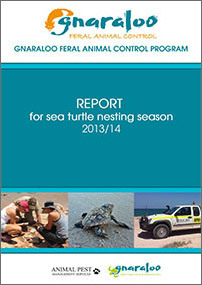 Our scientists use this data to inform responsible management and protection of endangered sea turtles and their critical coastal nesting habitat. 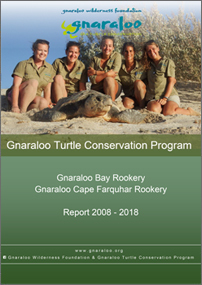 The Gnaraloo Turtle Conservation Program was started and managed by the Gnaraloo Station Trust (the predecessor of the Gnaraloo Wilderness Foundation) in 2008/09 and will end in 2017/18 unless there are new funding sources. 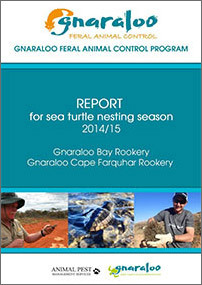 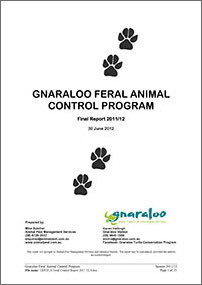 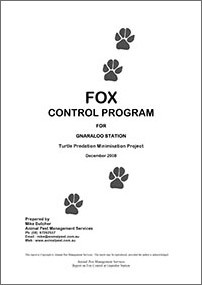 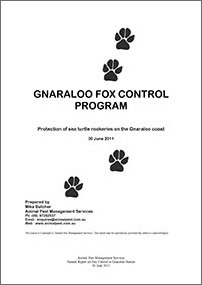 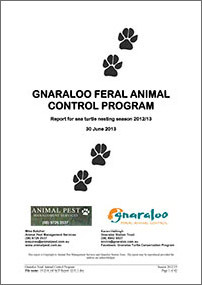 The Gnaraloo Feral Animal Control Program was started and managed by the Gnaraloo Station Trust (the predecessor of the Gnaraloo Wilderness Foundation) in 2008/09 and ended in 2014/15.